LG’s robotics experiments range from wearable exoskeletons to airport guides and cleaners. Next up, it’s starting work on a smart shopping cart that will follow customers around as they shop at Korea’s largest supermarket chain, E-Mart. 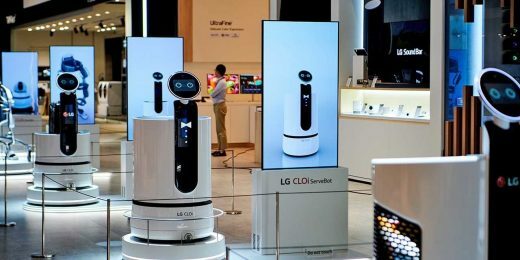 LG envisions it as a way to “free visitors from the hassle of pushing heavy carts by themselves” – which will come in handy for South Korea’s ageing population and all manner of lazy customers in-between. The company previously revealed that the shopping cart would boast a built-in barcode scanner, as well as a display to keep tabs on your shopping list. In addition, it said the robot would be able to lead you to your desired products, with users entering their requests into a companion smartphone app. E-Mart, meanwhile, is utilizing tech to stay ahead of its rivals. It recently unveiled a cashier-less store in Seoul and the inbound droids should also help position it as a high-tech destination. Neither LG nor E-Mart have confirmed an ETA for the smart carts. Let’s just hope people don’t try to take them home.